Press reports emphasized Deaton’s research into inequality and its troubling growth in recent years. “I think inequality has gone past the point where it’s helping us all get rich, and it’s really becoming a serious threat,” Deaton said. Still, Deaton has expressed the hope that the primary legacy of his research will be his meticulous precision — his “carefulness in measurement,” as he put it. Of course, the Sveriges Riksbank Prize is awarded for research in economics, not investing. That means that even though the contributions of Deaton and every other Nobelist are significant, there are material differences in how directly useful they are among the broad spectrum of investment professionals. We’ve been fortunate to have a number of these distinguished figures attend CFA Institute conferences over the years, so we decided to ask CFA Institute Financial NewsBrief readers to rank the contributions of these particular Nobelists. Of the following Nobel Prize winners in economics who have spoken at CFA Institute conferences, whose work has had the biggest positive impact on the investment profession? 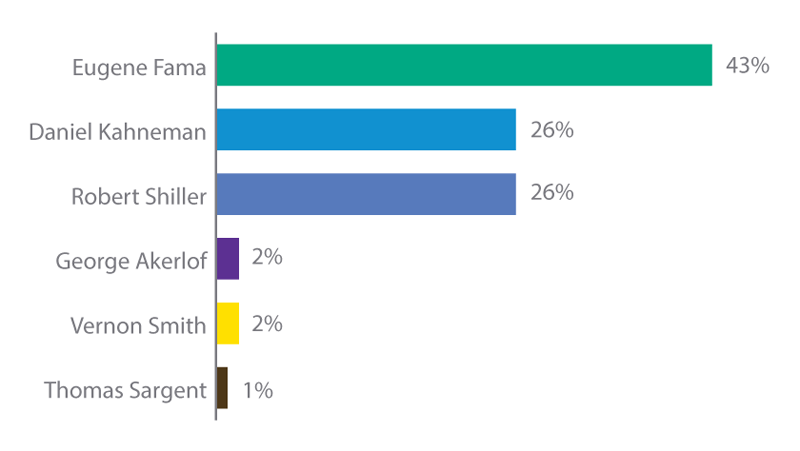 A plurality (43%) of the 559 respondents pointed to the contributions of Eugene Fama as the most influential, while Robert Shiller and Daniel Kahneman’s scholarship each attracted 26% of the vote. The work of Thomas Sargent, Vernon Smith, and George Akerlof evidently wasn’t as valuable to our readers, since they each garnered 2% or less of the vote individually. I went and looked at some of the speeches, interviews, and papers that these Nobel laureates have given at CFA Institute events and elsewhere, and I’ve selected some insightful ones to share with you. To increase the probability you’ll learn something new, I’ve listed them in the reverse of their ranking in the poll. Sargent is credited with leading the (bloodless) rational expectations revolution. One of his big ideas is that the people whose actions are described by models can predict the future as well as the person who created the model. Sargent discussed his work in a Take 15 interview with Ron Rimkus, CFA. Sargent examined the probability distribution function of potential future outcomes in terms of ambiguity aversion at the 66th CFA Institute Annual Conference in Singapore in 2013. Chetan G. Shah, CFA, reviewed Sargent’s book Recursive Models of Dynamic Linear Economies for the Financial Analysts Journal. Smith is most associated with economic experiments that put subjects in defined conditions and study their behavior. The owner of a sweet ponytail, he’s also a shoo-in for the title of “best hair” in this august company. Cynthia Harrington, CFA, interviewed Smith for CFA Magazine. Smith issued a warning about an Australian real estate bubble in the Daily Mail. Initially gaining fame for the study of markets for lemons (cars that are broken), Akerlof has a made a number of wide-ranging contributions, spanning the fields of identity economics, bankruptcies, and the phenomenon of reproductive technology shock. James Surowiecki examined Akerlof’s research into procrastination. Akerlof proposed a uniform tax on global carbon emissions. Cass Sunstein reviewed Why Free Markets Make Fools of Us, which Akerlof co-wrote with fellow Nobelist Robert Shiller. The best quote I can find on Kahneman comes from Richard Layard: “He made happiness respectable as a goal for society.” I won’t say anything more: That should induce you to at least watch the video interview. Kahneman discussed his work in a Take 15 interview with Ashvin B. Chhabra. Lauren Foster examined Kahneman’s warning about the stock-picking skills of financial advisers for this publication. Jason Voss, CFA, recounted a conversation between Kahneman and Nassim Nicholas Taleb. A founding member of our Future of Finance Advisory Council, Shiller is known for his penetrating insight on behavioral finance as well as a number of prescient market calls, including the dot-com and housing bubbles. Ron Rimkus, CFA, offered praise for Shiller’s approach to financial innovation. Shiller talked about the CFA Institute Statement of Investor Rights. Called the “father of modern finance,” Fama is most closely associated with the efficient market hypothesis and the three-factor model he created with Kenneth French. Robert Litterman interviewed Fama for the Financial Analysts Journal. Marc L. Ross, CFA, discussed a recent paper in which Fama asks to what degree the US Federal Reserve controls interest rates. Paul R. Rossi, CFA, summarized why Fama and French added another two factors to their famous three-factor model. If you liked this post, you should 100% subscribe to my newsletter.